In the Delta, the elemental world where survival reigns supreme and ashes to ashes and dust to dust truly means something, the earth took back on February 6, 1983 a friend it raised 84 years prior. Through the feelings of loss, the overriding sense of respect leaked out in the late 1990s, much like the sunlight peeking through the clouds in the overcast Delta sky. On March 14, 1998, the Mt. Zion Memorial Fund dedicated a memorial headstone for Sam Chatmon at Sanders Garden Memorial Cemetery in Hollandale, Mississippi. Over two hundred people attended the dedication ceremony at the Hollandale City Auditorium. 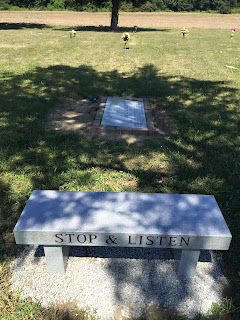 The marker read “Sitting On Top of the World” and included an inscription by MZMF founder Skip Henderson. It was funded through the generosity of popular musicians Bonnie Raitt and John Fogerty. Officiating the ceremony was MZMF director Skip Henderson with the invocation by the Rev. James Ratliff, pastor of Mt. Zion M.B. Church outside Morgan City, who has grounded the organization in its broader mission since 1991. 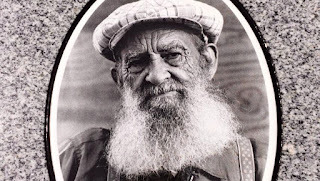 Canadian songster Doc MacLean drove twenty-six hours from Toronto, Canada to attend the dedication, during which he did the honors of performing, Sitting on Top of the World, with Libby Rae Watson. "Sam was a positive force in my life," informed MacLean, who lived with Chatmon in Hollandale an entire year to learn his style of playing blues. "Sam was a great ambassador," MacLean asserted, and he "had friends all over North America. He could have lived anywhere, but he stayed home in Hollandale." MacLean, a professional musician, planned to make 26-hour trip back to Canada following the event. Blessed with beautiful weather, the graveside service was a “pleasant one,” according to one observer. The Hollandale Fire Station hosted a subsequent reception in honor of Chatmon. With an abundance of food, including a cake in the shape of a guitar, the festivities included the screening of a film about the blues singer, a display of mementos relating to his life, several speeches of family and friends, and a live performance by Leland-based (Wilmot Born!) bluesman Eddie Cusic. Superintendent Howard Sanders said that while he knew Chatmon throughout his life, he "never looked upon him as a celebrity. I guess people at home all take things like that for granted. I had the opportunity to sit with him and talk about his music and his travels on several occasions. He was really a role model for the community, but he was never looked on as such. "I can remember that people from England and other countries would come to Hollandale and spend days with him, talking about his music. 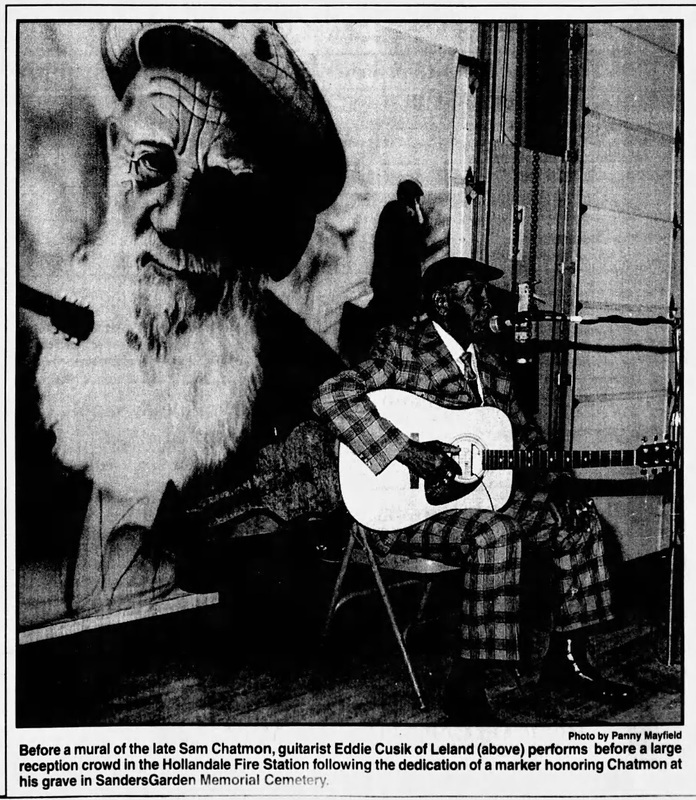 He was really well respected for his expertise in the blues." 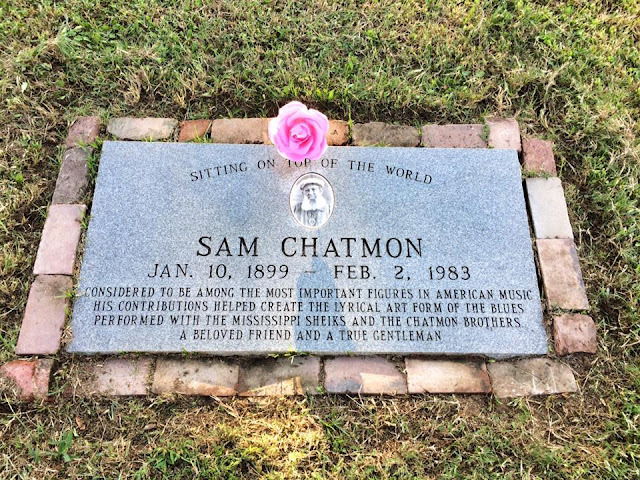 Hollandale Mayor Oscar Peace Jr. has proclaimed Saturday, March 14 as "Sam Chatmon Day" to "recognize the many outstanding contributions to music through the songs Sam Chatmon hos written and sung." A local acquaintance and friend, Leslie Deshaza, recalled, "I knew Sam Chatmon from a small child," Deshaza says. "He and my brother Bo used to play together. Sam used to say 'I could play seven days and never play the same song.'" Other friends commented, "I wish Sam could have been here to see this…but his music is alive and he’s “Sitting on Top of the World.” . Some folks, who wanted to continue the celebration, headed over to the Walnut Street Bait Shop in Greenville to enjoy libations as well as the musical stylings of T-Model Ford and the John Horton Band. 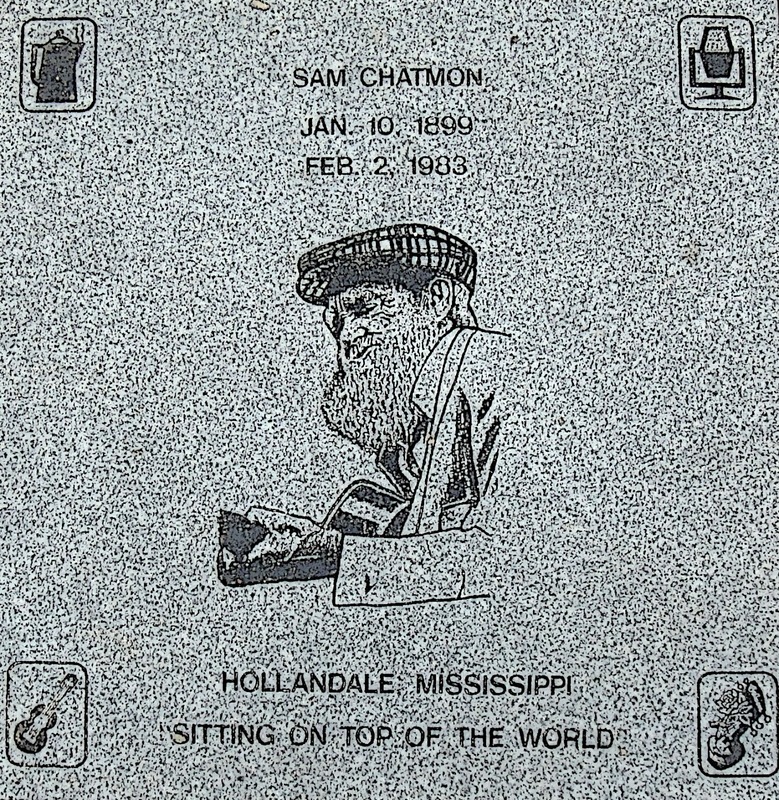 The first headstone erected for Sam Chatmon in 1998 was engraved improperly, yet able to be corrected and not noticeable initially. Over time, however, the misspelled word became more and more noticeable, which required periodic correction. 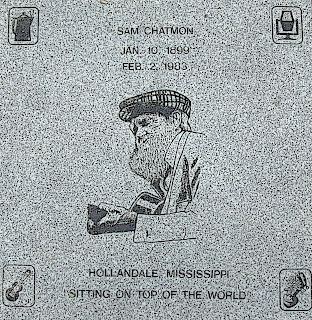 The cameo of Chatmon on the top of the marker also became a vague, dark square. The deterioration of Chatmon’s headstone was one of the problems addressed in the initial months of the tenure of the new director of the Mt. Zion Memorial Fund. It had deteriorated significantly during the past seventeen years due to lawn mower damage and the unforeseen effects of erosion on the flat stone. The intense amount of weathering rendered the etched photograph of the musician unrecognizable—more like vanished in the dark black space. Due to the extent of damage and vulnerable nature of the flat stone, the MZMF decided to replace it with a more durable headstone, one less susceptible to damage from routine lawn maintenance and designed to resist the effects of weather. The suggestion was also made to erect a commemorative bench near his grave site. The Indianola Blues Society and the Mississippi Blues Commission, as well as several friends and admirers, funded the replacement marker. Both the new headstone and the bench were unveiled in a ceremony on September 26, 2015. Dr. Edgar Smith, of the Mississippi Blues Commission, was on hand at the unveiling to comment on the significance of Sam Chatmon's legacy to the state. 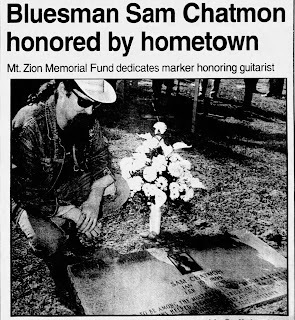 Roy Schilling, one of the unswerving supporters of the MZMF and one hell of a model American, organizes the Sam Chatmon Blues Festival in his hometown of Hollandale each fall. 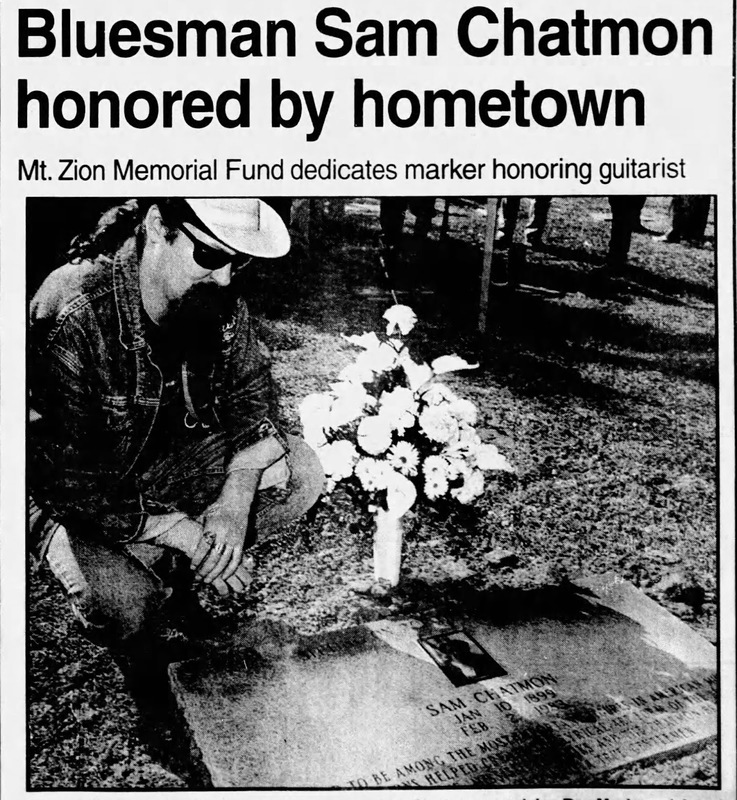 The MZMF also recognized another, most pressing concern that needed to be addressed, namely, the unmarked grave of Sam's brother, Armenter Chatmon, aka Bo Carter—a very popular and well-recorded songwriter who died in 1964. Sam had carried his body from Memphis and buried him in a small rural cemetery in Nitta Yuma, just down the road across the Sharkey County line. In recognition of his efforts to bring his body back home, this project was for Sam.